Windsor, ON: While most children can explain what a water hydrant does, they may not know what the colours on a hydrant mean. In fact, it may be a little known fact to many adults as well! ENWIN seeks to change that with the installation of a Water Hydrant Safety and Information Feature at The Safety Village in Windsor. The water hydrant colour code used in Windsor-Essex and most of Canada was developed by the National Fire Protection Association (NFPA). Hydrant bonnets (the top of the hydrant) are painted either blue, green, orange or red to indicate the volume of water the specific hydrant can produce. The volume of water flow is measured in gallons per minute (GPM). Hydrants with blue bonnets can produce 1,500 GPM or more, whereas red hydrants produce 500 GPM or less. The NFPA also allows the use of coloured, reflective discs which can be found on hydrants across Windsor. This initiative was spearheaded by ENWIN and the Windsor Utilities Commission in coordination with Windsor Fire and Rescue Services. As a long-time partner of The Safety Village, ENWIN values the experiential learning environment offered in the The Safe City. More than 8,000 students, adults and seniors visit The Safety Village each year, learning about how to stay safe around various hazards in our community. This includes ENWIN's electrical infrastructure demonstration area, where educators warn children about the dangers and hazards of electricity. This area now features an information sign explaining the water hydrant colour code, and warns children about the dangers of tampering with water hydrants. "We're pleased to add a component of water information and safety to our presence at The Safety Village," said David Melnyk, Director Water Distribution. "We've been able to take some hydrants that were no longer being used in the field and put them to great use. With a fresh coat of paint they look great, and will help us educate the public about what the colours mean and the importance of staying safe around water hydrants." 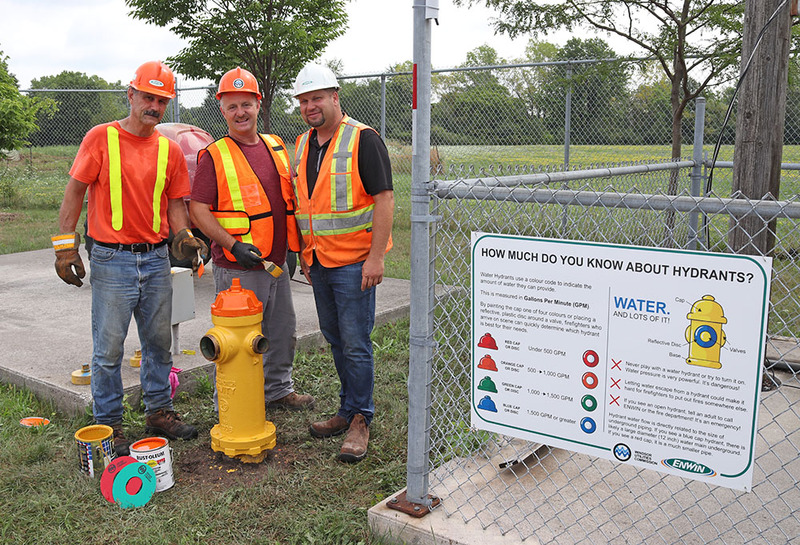 A special thank you to Christopher Jaworski, Gerard MacDonald and Patrick Gaudette for installing, painting and outfitting the hydrants at The Safety Village. Click the link below to watch a video featuring this project.